Melt the butter in a large nonstick skillet over medium-high heat. Add the flour and cook, stirring constantly, until golden, about 1 minute. Add the tomatoes and cook, stirring constantly, until the mixture bubbles and thickens slightly, 2–3 minutes. Stir the cheddar cheese, milk, Parmesan cheese, mustard, and salt into the skillet. Cook, stirring constantly, until the cheese melts and the mixture is smooth, 2–3 minutes. Stir the pasta and ham into the skillet and cook until heated through and well coated, 1–2 minutes. Let stand 2 minutes before serving. Yields scant 1 cup per serving. The sauce is made in one skillet, and if you have any leftover pasta in the refrigerator, you won’t need to dirty a second pot to cook the pasta. Leftover spaghetti works best if cut into 1- to 2-inch lengths, and leftover large pasta, such as rigatoni or ziti, could be cut in half. 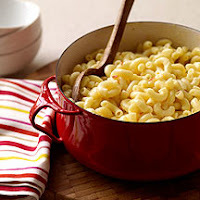 You’ll need about 1/2 pound dry macaroni to get 4 cups cooked.